While the featured addition in yesterday's OS X 10.10.3 developer seed was the new Photos app, Apple is addressing other issues with the forthcoming update, and one of these focus areas is emoji, which is seeing several changes and improvements. One immediately evident change is the menu option used to bring up the character palette where emoji and other symbols can be browsed and selected. The Character palette a is systemwide option generally accessed through the "Edit" menu in most Mac apps. On OS X 10.10.2 and earlier, the menu item is called "Special Characters," while on OS X 10.10.3, it is labeled "Emoji & Symbols". The change offers a clearer description of what can be accessed through the menu item while specifically giving a strong visibility boost to emoji. Another significant change for emoji in OS X 10.10.3 is the apparent laying of groundwork to support skin tone modifiers proposed for the Unicode 8.0 standard. Apple noted almost a year ago that it was working with the Unicode Consortium to bring more diversity to emoji, and the proposed skin tone modifiers are a significant step in that direction. 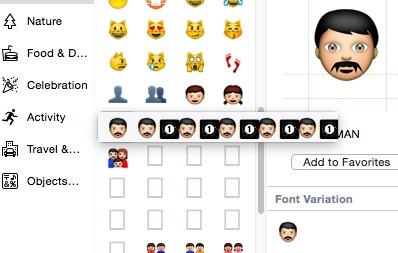 OS X 10.10.3 also appears to include a number of placeholders for new emoji in the character palette, but no images or descriptions have yet been added for these entries. The skin tone modifier proposal would apply to certain skin-colored emoji, allowing users to select from a range of skin tones to best represent the message they wish to send via emoji. As can be seen in OS X 10.10.3, many of these skin-colored emoji now display an arrow that when clicked brings up a menu of options. While the menu is currently non-functional, it does show the selected emoji followed by five instances of the emoji paired with a number one inside a black box. These are presumably incomplete implementations of skin tone modifiers, waiting for the Unicode Consortium to finalize its standards for Unicode 8.0. Just yesterday, the Unicode Technical Committee officially moved the technical report covering skin tone modifiers and other emoji changes for Unicode 8.0 to draft status, and Unicode 8.0 itself has been approved for beta release. In one other change for emoji in OS X 10.10.3, the pop-up emoji picker available in many apps has been transitioned from a paginated layout to a single larger vertical-scrolling page. Under OS X 10.10.2 and earlier, the various emoji categories are contained on separate pages within the picker, with users needing to click on a toolbar along the bottom to change pages. 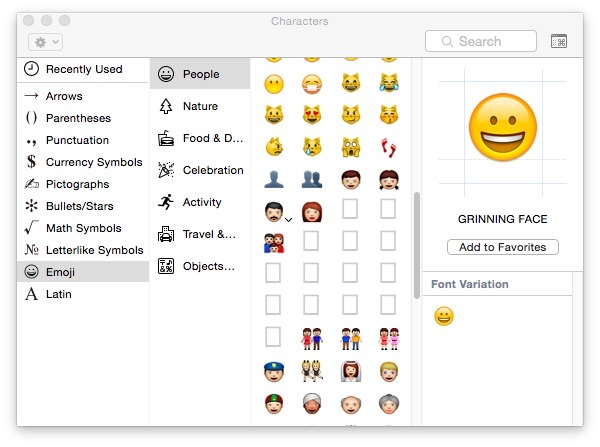 In OS X 10.10.3, all emoji are displayed on a single page, and while they are still organized by category and users can still click toolbar buttons to quickly jump between categories, users can now also simply scroll the entire list if they wish. All of these changes come as emoji have exploded in popularity, spreading beyond their origin in Japan to be embraced worldwide as a quick, fun, and easy way to share a variety of emotions and thoughts, most commonly within messaging apps. As a result, Apple has been working to increase support for emoji across iOS and OS X, and this first OS X 10.10.3 developer build is a clear sign of that continued interest. Really? Above all else, this takes precedence? I didn't even think emoji were supposed to look like real people, hints the unrealistic yellow skin and missing nose. At last. Something for the professionals. This makes up for Final Cut X. Seriously folks, if you were on the fence about switching to a different OS because of Apple's long string of debacles over the past few years, this should be your "table flip, exit stage left" moment. How about video driver issues on retina macbook pros? I've had more lockups since Fall than I've had in the previous 10 years! And while they're at it, instead of screwing around with goofy emojis, how about fixing the absolutely horrendous calculator app‽ It's really an embarrassment -- the window controls don't even line up and C/AC don't work right! The skin tone modifiers aren't for the the yellow emoji. They are for the people emoji. The ones that look like real people but only include caucasian looking people. 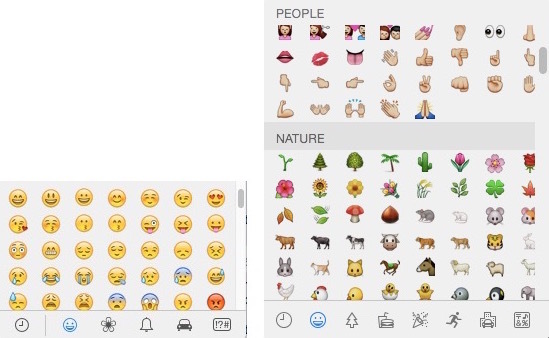 Finally MacRumors shows the skin tone modifiers are for the people emoji. The last article on this was ridiculously bad because it made it seem like the tone modifiers were for the yellow smiley faces. Really? Above all else, this takes precedence? Maybe 2 Apple employees are working on this out of about 98,000 employees. How do you think this 'takes precedence'? Yep. Only thing they're working on.